Known as the oldest street in the Philippines, Colon Street was built by the Spaniards during the time of Miguel Lopez de Legaspi. Named after Cristobal Colon (Christopher Columbus), it is the heart of downtown Cebu, a glittering area by night lined with movie houses, restaurants, department stores, and other business establishments. Developed by Miguel Lopez de Legaspi, the place became the center for commercial activities in downtown Cebu. 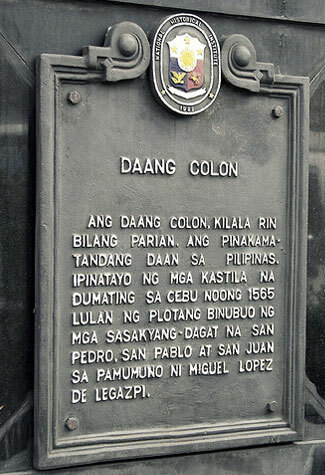 Through the years, Colon remained the lifeline of trade and commerce in colonial Cebu. It was in Colon where the first business establishments and offices where built and flourished in Cebu. It was also the place where most happenings took place such as social and cultural events. The street similarly has become a witness to the rise and fall of Cebu’s economic and political competence over the years. Labeled as the center of commerce and trade, many universities were built near or along Colon Street such as University of Cebu, University of the Visayas, University of San Carlos, and University of San Jose-Recoletos. Colon Street is now lined with many big commercial establishments. Investors believe that profit is halfway achieved once they invest in Colon. Jeepneys, taxis and buses as well have replaced the calesas (horse-drawn carriage) of long ago as the means of public transportation that move in and out of this street. In 1990’s, the malling culture of America arrived in Cebu. Malls of various sizes began to sprout almost simultaneously all over the metro, leaving businesses in Colon threatened. Businessmen then observed an evident decrease of customers and shoppers in Colon. A number of business establishments were even closed then. Shoppers preferred an air-conditioned and more relaxing ambiance of a mall. However, in recent years, a surge of shoppers has been noticed. The main draw obviously is the cheap merchandise and reasonable price of goods from the many bargain stores. People from different walks of life visit this place in search of low-priced and economical goods. Business owners coming from nearby provinces of Cebu consider Colon as an ‘easy on the pocket’ spot for shopping. Colon never lost its position as the bargain hunters’ paradise. Most old stores and even the newer shops on Colon offer much cheaper prices compared to their counterparts in the malls, making them the primary choice for most shoppers. Colon shops are a one-stop shop where you can buy everything with price tags assuredly lesser than other places in Cebu. shoppers are said to double in number. The activity has been patronized mostly by the common people of Cebu. It’s like revisiting an old street, and re-visioning it. It takes people back on a journey to that time when it was the main commercial street in all its grandeur, a locality of its own, and yes, with an overwhelming character. When Christmas draws near, Colon is the perfect location to visit. Shoppers congest Colon Street as they search for good value for their money. It’s a one-stop shopping street where you can buy everything you want and need. It’s a place where leisure and commodities are combined. Fashion jewelry, Ready-to-Wear, shoes, bags, among others. After a tiresome day of shopping, Colon treats you with the movie houses located along the street. Fast Food and commonplace restaurants are also there catering to your appetite. Pamper yourself with the luxury of shopping in temperature-controlled department stores. Indulge your worn-out legs with convenient taxis and colorful Jeepneys dashing all over the street willing to serve you with the best service they could give. Colon guarantees quality service to all customers, the only place where shopping is made even more exciting and pleasurable. So if you think paying less and buying more is impossible, think again, as business owners in Colon make that happen. Experience the magnetism of Colon Street!